Nestled high on a ridge top along scenic road on St Croix's prestigious North Shore sits Brimstage Estate, named after a quaint country village located in the Northwest of England (the owners parents are the Lord and Lady of the Manor Brimstage.) The 3 bedroom/2.5 bath villa offers 180 degree views of St. Croix that stretch from the North to South shore and include; the US and British Virgin Islands, Salt River, Buck Island, Green Cay, and Christiansted. The pool with swim up pool bar and outdoor kitchen offer an ideal place to enjoy an afternoon cocktail and burgers on the grill or perhaps end your evening in the hot tub sipping champagne as you gaze out upon the twinkling lights of Christiansted at night and the million dollar view. Further Details: Ideally situated facing east this charming Caribbean villa takes full advantage of the constant trade winds. The main villa consists of an open living/dining room, kitchen, master bedroom and bath, and half bath. There are 20 foot open beamed ceilings and lovely ceramic floors throughout. Step through the double French doors out onto the wraparound arched gallery that has an outdoor dining table and sitting area as well as shaded hammock. Just off the main patio besides the pool, outdoor kitchen and hot tub is the separate Caribbean themed guest sleeping quarters with a large private deck. The two bedrooms have separate entrances and share a common bathroom. One of the bedrooms has a queen size bed and the other has two queen size beds. Below the guest sleeping quarters is the office with its own deck and is equipped with broadband internet, copy/fax machine, coffeemaker, sink, and microwave. 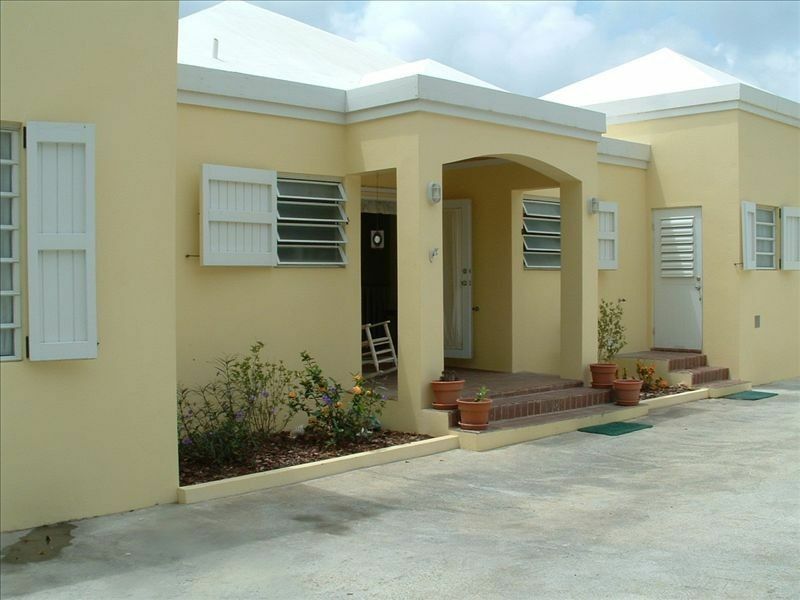 The villa is located mid-island on St Croix and is within 15 minutes of Christiansted and 20 minutes of Frederiksted. It is 5 minutes from Cane Bay and the beach, snorkeling, and diving and 10 minutes from golfing at Carambola. There is a tenant living in the separate guest house on the hillside below the main house in case of emergencies; your privacy is their main concern. You will be met at the airport and escorted to the villa. we enjoyed the house- the views were great. The pool was a little cool but otherwise all was perfect. We would definitely consider a return visit. Happy that you enjoyed the place. Apologies for the pool being cool. Unfortunately the solar panels that I had installed that help to heat the pool water do not work during overcast rainy days like you experienced at the start of your visit. Perfect St. Croix Home! Clean, organized. Views galore. ALL of the amenities! Hate to leave. Very convenient location. Never used the AC due to the bountiful breezes. Steps to different parts of the home. Wally is very blessed to have a slice of heaven on earth! Had a wonderful time. This home is in the perfect location to see St Croix. Views are gorgeous and the owner has provided everything you could possible need. The hot tub was great on the cool nights. I can’t say enough about how much we loved Bringham/Clairmont Estates! The pictures don’t event get close to doing the property justice. The views are incredible - you can see the entire island and ocean in either direction. The property is impeccably clean, the furniture is comfortable and stylish and the house has everything you would ever need! We loved being able to cook at the house and I LOVED being able to have everybody pack light because we could do laundry while at the house — the first vacation ever where I came back with all clean cloths. Morning coffee on the deck with the sunshine and ocean breeze started each day in a dreamy way. My daughter would even eat her morning cereal in the pool at the swim up bar! Also, the house had beach chairs and snorkeling gear that we tossed in the back of our car and used everyday as we explored the endless beaches (we also left a boogie boars there for the next visitor). The location of the house is great too -- safe, private, central. Wally and the team that managed the house were wonderful to work with - they all display true hospitality! St. Croix is our favorite place on earth and we didn’t think our visits could get any better — until we found this home. We will be back to our home away from home! We enjoyed staying at this property on St. Croix. Located high on a mountain, the ocean views were spectacular. At night the stars lit up the sky. It was easily accessible via rented van. The pictures you see are exactly what you should expect. The main house has a master bedroom and 1 1/2 baths. The side unit has two bedrooms and a full bath. The back porch has a pool and hot tub. It’s a charming house!! We had booked a stay at Wally's villa from Nov. 13-22, unfortunately his pool was not going to be ready after an extensive post hurricane remodel. Wally bent over backwards to help us find another villa close by, and kept in contact with us to make sure this glitch didn't hurt our vacation. I'm looking forward to staying at this villa in the future! Thanks, Wally! Peak Season, Dec 15th - April 15th: 1-2 people 2500 per week, 3-4 people 3000 per week, 5-6 people 3300 per week. Off season April 15th - Dec 15th: 1-2 people 2000 per week, 3-4 people 2500 per week, 5-6 people 2700 per week.